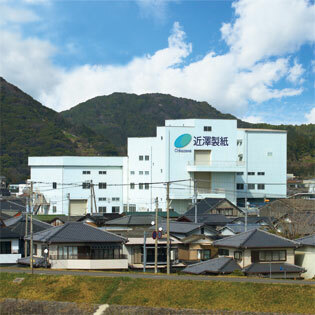 English site | Chikazawa Paper Co., Ltd. The manufacturers can see the users, while the users can the manufacturers. Accumulating new technology and expertise of material properties,material combination,processing materials to maximize their performance,and pursuing further themse. Chikazawa takes these as its basic attitude toward Research and development.Chikazawa puts this into a phrase,"satisfaction through pursuance of perfect designing"and reflects this attitude on all products to convey it to the users. Its product packages carry dimensions, absorption capacity,and other specifications in clear,visual marks and numerical value so that the users can pick up the best suitable one for them. This is an example of Chikazawa's pursuance of perfect designing. Chikazawa's company symbol is composed of letter "C"that stands for "Chikazawa"and an oval that represents "a dorp of water"expressing its gratitude for "the blessing of wa available around its and has brought it up. "Around 1930 Start business with Japanese paper making. Installed the first paper making machine,and started the production of tissue paper "Kyohanagami"(changeover to paper making on machine). Started the production of mild medicines and sanitary napkins. Started the produstion of paper diapers for the old(layer-built type). Installed a production line for paper diapers for the old (underwear type) Expanded the production line for paper diapers for the old (flat type). Completed the paper diaper factory. Expanded the production line for paper diapers for the old. Completed the construction of the Konotani Plant. We are working to meet the true requirements of a a long-life society. We call the present society as"society of longevity" This is because we think the pleasure of living is the true meaning of the term of ''longevity.'' For the elderly to enjoy the longevity, no doubt they have to stay active and be proud of themselves in their life. The fundamental concept underlying our product making is easiness to use. For the elderly to enjoy longevity, we are making "care" products, such as disposable pull-on type diapers(Medipants),etc., not for the purpose of mere product making but for enhancing their daily life. To fulfill our desire, we, Chikazawa, are working as hard as we can to make ideal "care" products to help them live independently and zestfully. In a continuing effort to improve technology and service, Chikazawa has just completed constructing a new plant serving as the base for activities: information, service and distribution. The new plant together with the plant at our head office, we are committed to doing our best to the enrichment of the ''longevity'' society. Chikazawa's technology and service, watching the next generation with triple eyes: viewing, observing, and caring, will keep evolving to make the life of the old better and more pleasant. Copyright (C) Chikazawa Paper Co., Ltd. All Rights Reserved.